No life is set in stone. Malcolm was a young man with boundless potential but with the odds stacked against him. Losing his father under suspicious circumstances and his mother to a mental health hospital, Malcolm fell into a life of petty crime and eventually prison. Instead of letting prison be his downfall, Malcom found a religion, a voice, and the podium that would eventually make him one of the most prominent figures in the burgeoning Civil Rights movement. The 2017-18 Great Michigan Read, X: A Novel, is a tale of reinvention and redemption. 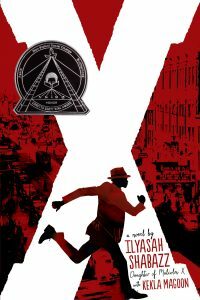 Written by Ilyasah Shabazz, Malcom X’s third daughter, and Kekla Magoon, X is a young-adult novel with a writing style and message that will appeal to readers of all ages. Join us as we work to explore the Michigan roots of one of the most influential leaders of the twentieth century.